Hello my crafty friends! Are you all ready for a new challenge? Kate framed her sentiment soooo beautifully! I love the pearls and gorgeous flowers! 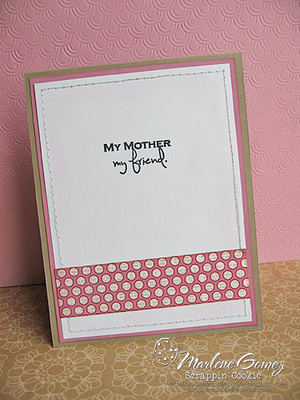 This beautiful sentiment stamp is from the Happy Easter stamp set. I love the papers Kate used on her pretty card! Wow! 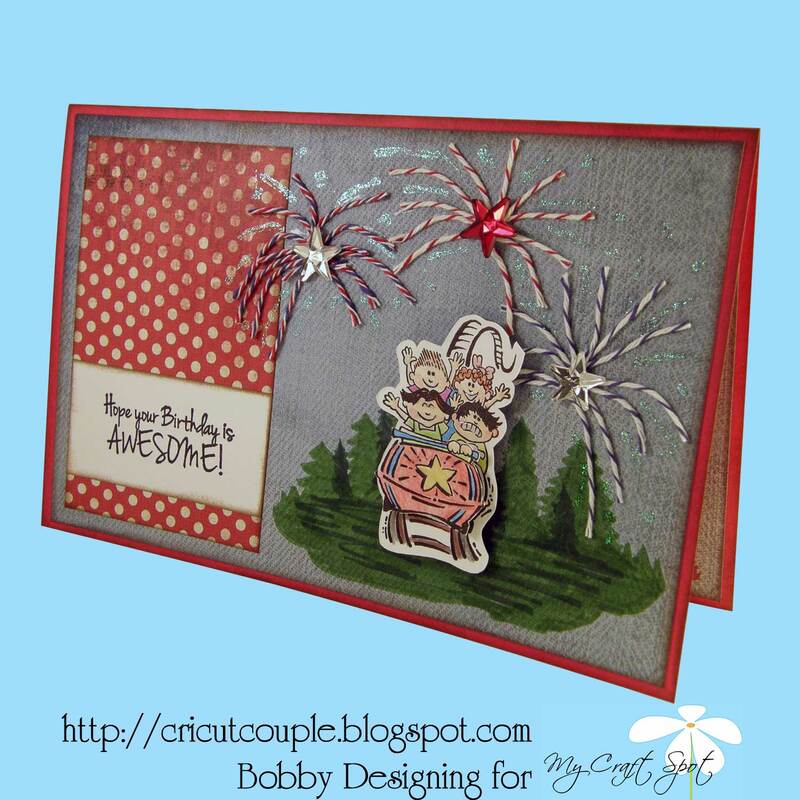 Bobby's card has so many fun dimensions! I love that gorgeous butterfly! 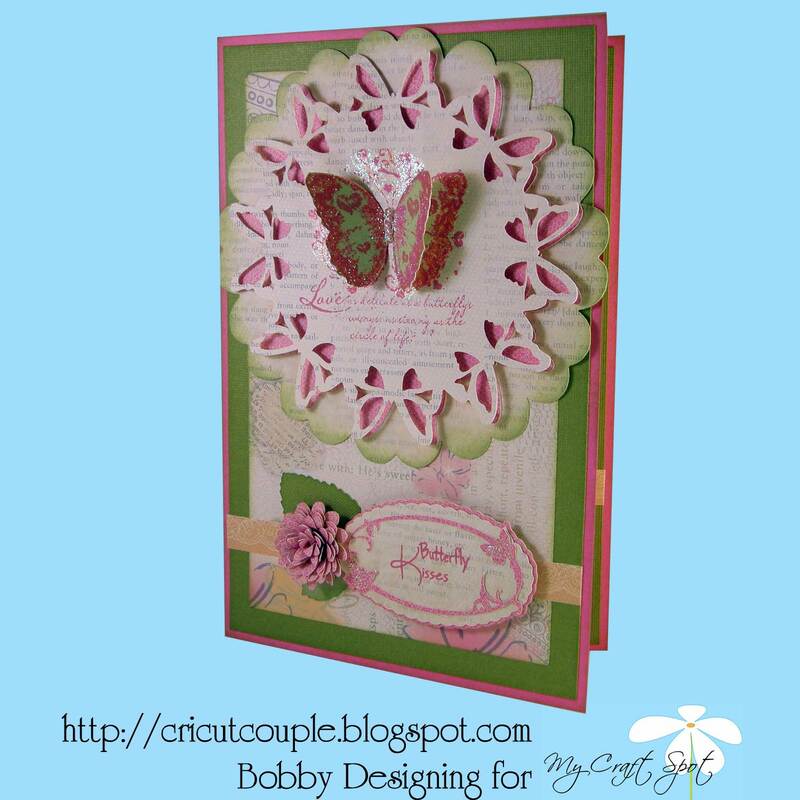 I love how the butterfly looks like it has just landed and the butterfly doily background is just perfect for this card! 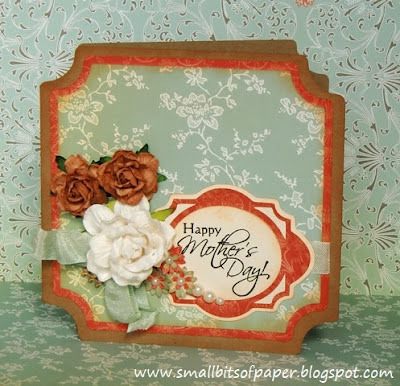 What a gorgeous combination of paper colors! I love how Jayne stitched around the edges and her inking is fabulous! Jayne has two projects to share with us today! Yay! 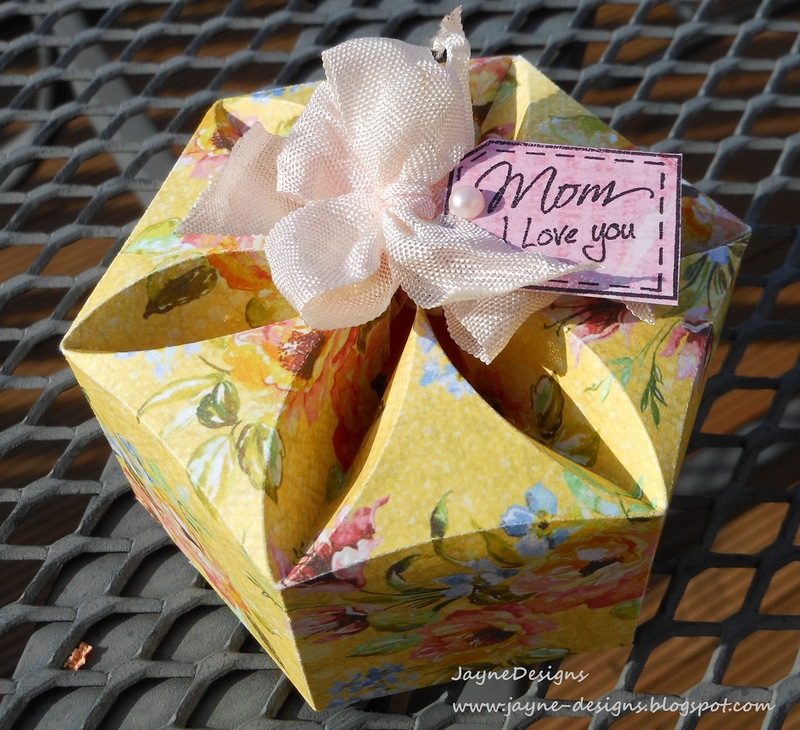 This gorgeous box is from the TBBM2 cartridge and I love how Jayne tied the center with Crinkle Ribbon. This is such a pretty gift box for Mom! 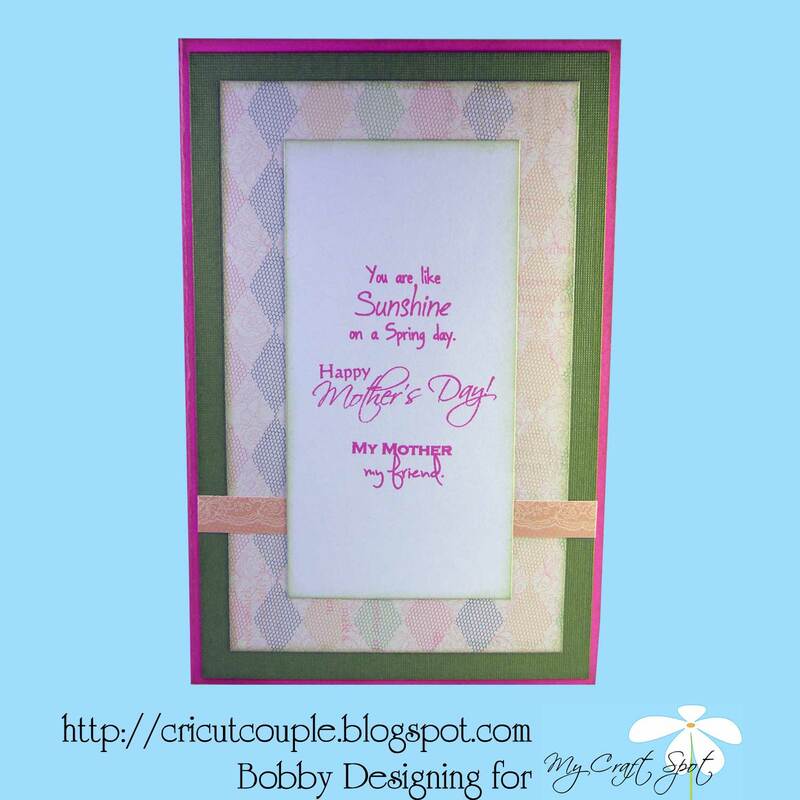 Ally's cards are so bright and cheerful! I love the pretty flowers and the banners with the hearts! The inside of Ally's card is pretty too! 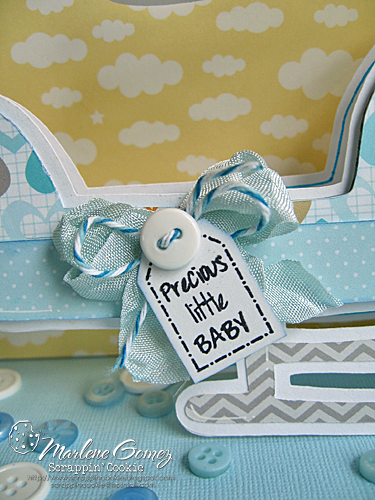 I love how Amber added the button and twine to her Crinkle Ribbon bow and that digi is soooo cute! The shading on her face is perfect! 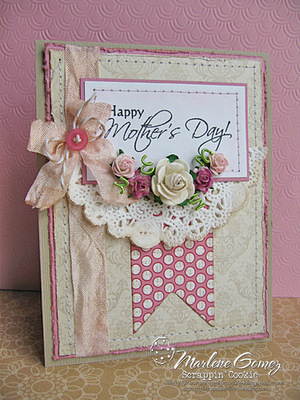 Marlene's card is just gorgeous! I love the sewing and the distressed edges! The bow and flowers are soooo pretty! Hello my crafty friends! 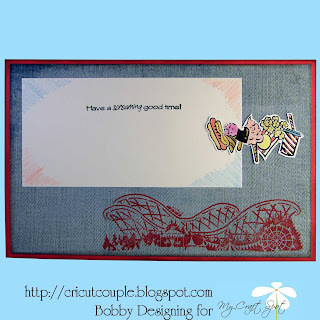 Today I have instructions for the last of my projects from the Spring Stamp Release Party! 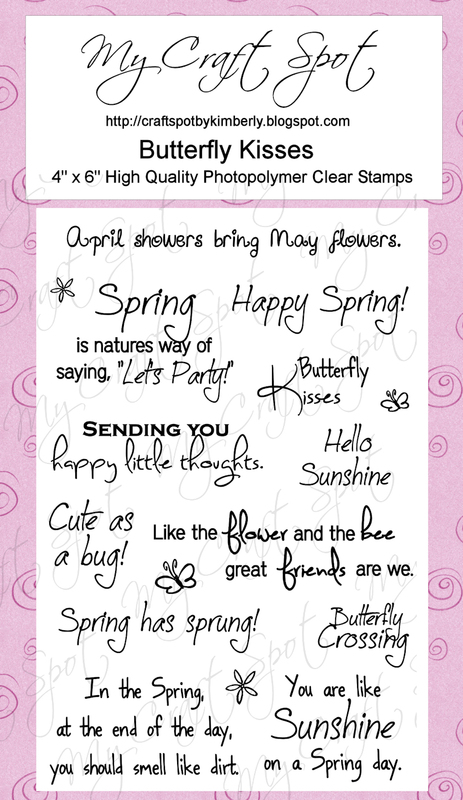 The stamped sentiment is from my new Butterfly Kisses stamp set. I cut the basket at 5 inches from the new Tags Bags Boxes & More 2 cartridge. 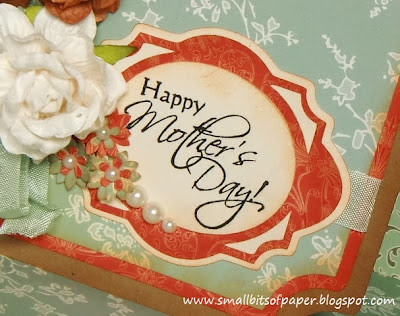 The patterned paper I used on the flowers is all from My Minds Eye. The green is from Bazzill and the cream is from Close to My Heart. 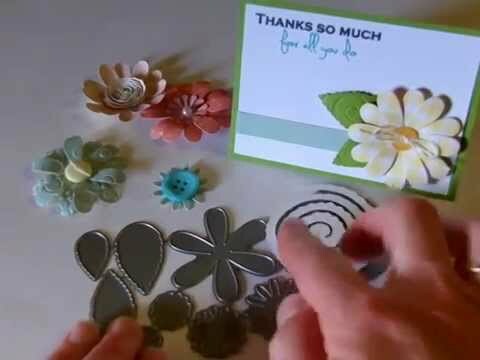 Cut 2 of each size flower (Button #12) so you can layer the petals - 2", 1.5" and 1.25". For the centers, cut one of each size (Button #4 on the first row) - 2", 1.5" and 1.25". I used the Petal Roller from imaginesque to roll the centers and shape the petals. Then I inked them with Antique Linen and Walnut Distress Inks. 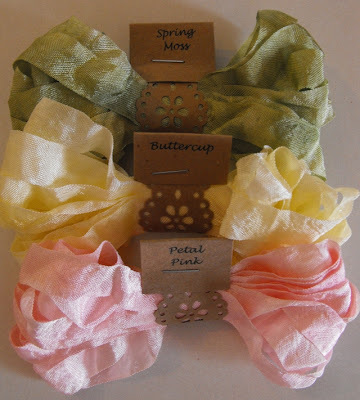 Click HERE for a video showing how to make these flowers! 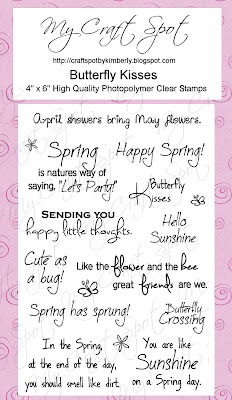 I stamped tiny flowers from the Butterfly Kisses stamp set along the basket handle. I also matted it with green and then cream (trimmed with scallop edge scissors) before attaching it to the basket. I wanted the grass to be dimensional so I trimmed them with the Martha Stewart fringe scissors and then inked them with green ink from Close to My Heart. Here are some pictures of the Martha Stewart Fringe Scissors. Winners from challenge #52 - Make it pop! You won the Traditional Bakers Twine Pack!! Be sure to grab your challenge winner button on the left side bar and Email me with your address so I can mail your prize. Hello my crafty friends! Today I have instructions for the baby carriage shaped tag that I posted during the Stamp Release Party. I cut this baby carriage and all of its pretty layers at 5 inches from the Wrap It Up cartridge. I cut a base cut in cream so the back of the tag would be a solid color and then cut it again in the pink patterned paper. 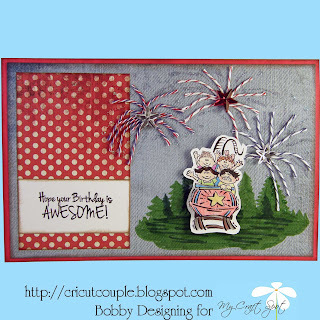 The cute little tag is from my new Tiny Tags stamp set. I love that it has a 'stitched' border stamp! I just punched a hole and tied it to the baby carriage handle with a bit of twine (American Crafts). 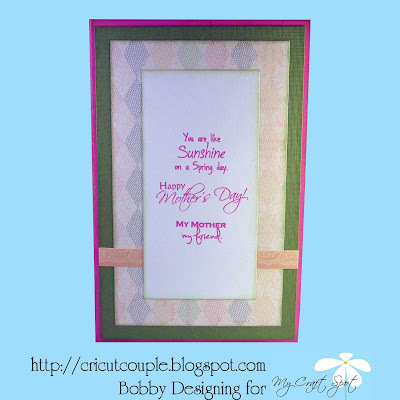 The cream paper is from Close to My Heart and the Pink patterned paper is from My Minds Eye. I inked all of the edges with a brown ink from Studio G. The brown is from Paper Trey Ink. Challenge #53 - Things That Go! Hey Everyone! The sun is shining and summer is almost here! Makes you want to go someplace fun! I hope you are all ready for a new challenge! 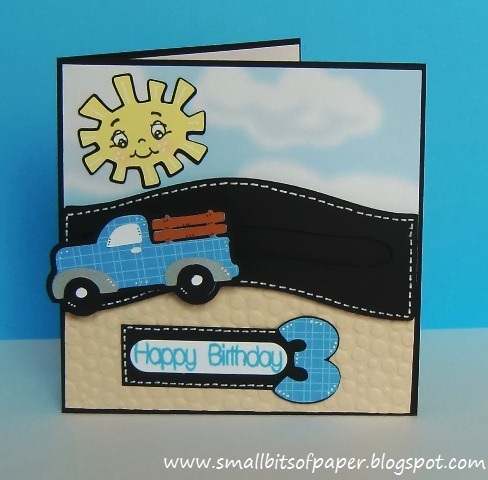 Aymee's card just feels like summer to me! I love the cute papers and that bike die cut is so pretty! 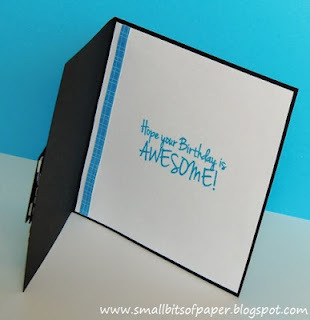 I love how Aymee stamped her sentiment onto the seam binding! 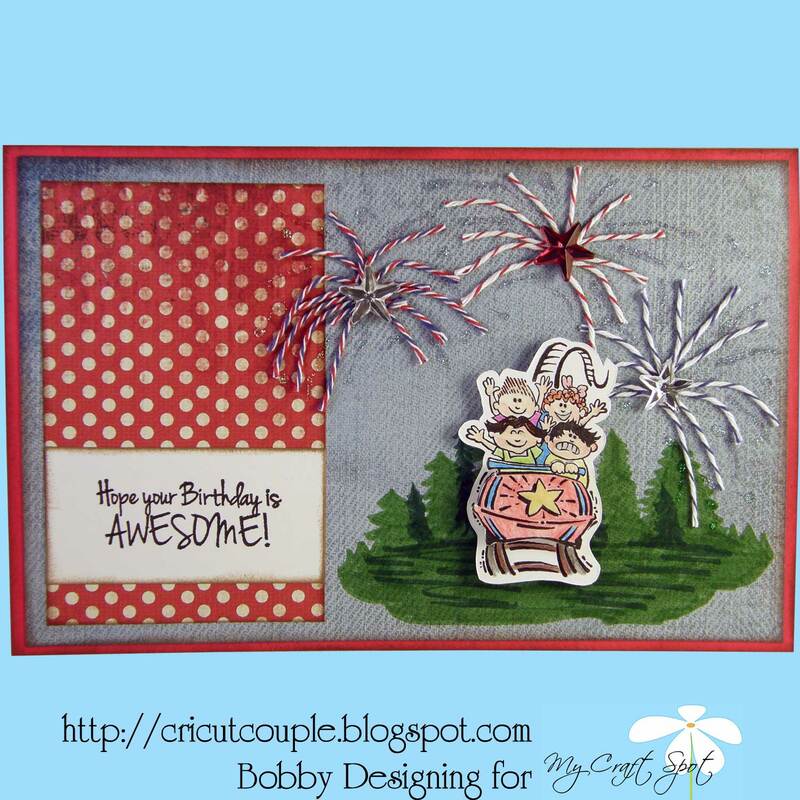 The digi on Candy's card is gorgeous and I love how she added the bakers twine as a border! 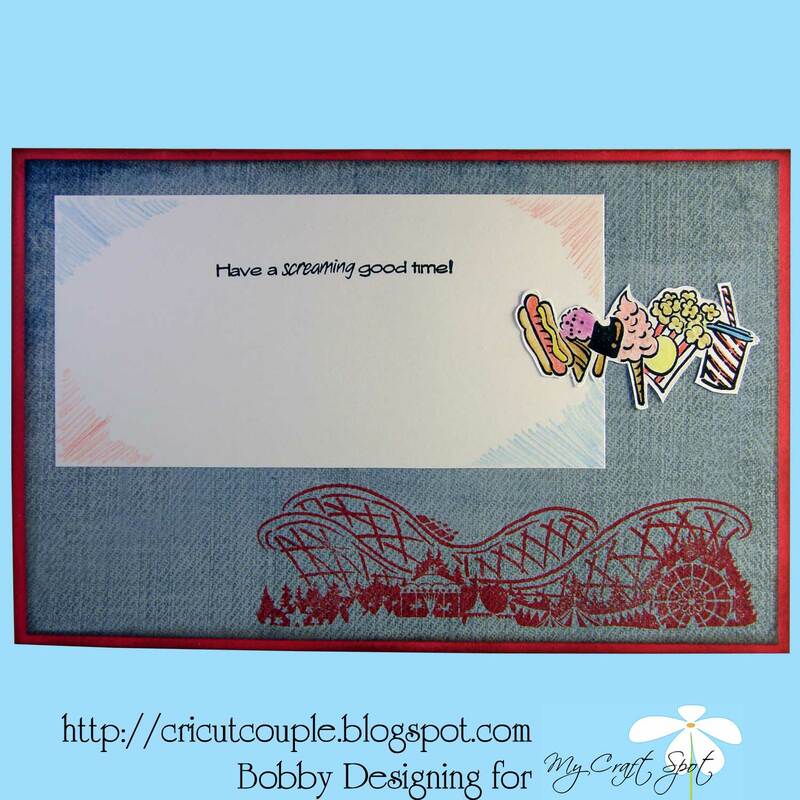 This stamp is from my new Birthday Wishes stamp set. Check out the awesome fireworks Bobby made with bakers twine!! What a fun idea! The star rhinestones in the center of the fireworks are the perfect finishing touch! I love how the truck on Kate's card can drive down the road!! How fun is that?!?! 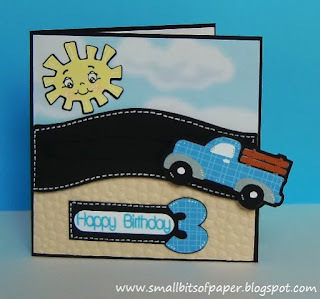 Any little boy would be delighted by this cute card! Marlene's shape card is soooo pretty! 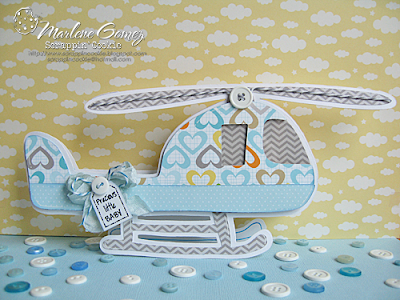 I love the soft colors and pretty papers Marlene used on her sweet baby card! Winners from Challenge #51 - Inside & Out! Monday Challenge #52 - Make it Pop! Winners from Challenge #50 - Easter!